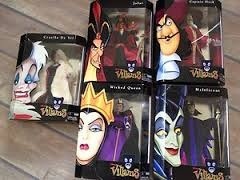 Disney Villains dolls. The Evil Queen in Snow White and the Seven Dwarfs in 1937 Captain Hook in Peter Pan 1 and 2 in 1953-2002 Maleficent in Sleeping Beauty in 1959 Cruella De Vil in 101 Dalmatians in 1961 Jafar in The Return of Jafar in 1994. Wallpaper and background images in the Disney club tagged: disney. This Disney photo might contain anime, grappig boek, manga, cartoon, and stripboek. I don't like all of those villains they are evil. Cruella De Vil from 1961 on 101 Dalmatians animated she's my favourite villains but she's still evil. On Peter Pan 1 and 2 Captain Hook is mean and evil, worst kills everybody i liked that Croccadile and Octopus gets Captain Hook cause he's a Cotfish!